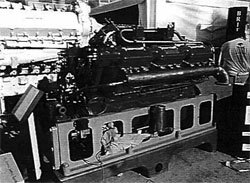 The continued success of the Fast planing craft that emerged from builders such as British Power Boat, Vosper Ltd and Thornycroft, very much depended on equal success by the engine manufacturers in developing and producing suitable marinised engines to power the craft Names such as Perkins, Power Meadows, Packard and Rolls Royce are as synonymous with engines as the above mentioned boat builders are with fast craft. 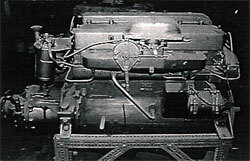 Some boat builders also developed their own engines and examples of these and the aforementioned are usually on display at the Marchwood site of the BMPT. Smaller engines include the PETROL MEADOWS which was used to power many of the smaller boats produced by British Power Boat and the ubiquitous 13Ohp PERKINS S6M diesel, one of the first production diesel engines. Larger petrol engines include a new ROLLS ROYCE SEA GRIFFON which is on loan from Dennis Kaye, the PACKARD 2500M on loan from Pounds Shipping, the ISOTTA FRASCHINI W18 on loan from Hampshire County Council, and finally the argest engine on display is the massive 3700hp NAPIER DELTIC diesel on loan from the Napier Heritage Trust. Other engines on display are the THORNYCROFT HANDY BILLY, the MORRIS VEDETTE and the LISTER diesel, On display only at BMPT Open Days is the THORNYCROFT RYI2. The following photographs show some of the engines on display. This engine is one example of a "builders" exigine and was used to power several types of craft built not oniy by Thornycroft, but others as well. This type or similar were used in the 67fi Thornycroft RAF HSLs (early units), the 73ft Vosper built RAF HSLS, each having a pair of these for main propulsion. This type had been used earlier in the 55ft CMBTs mid earlier craft built for the RAF. This large engine was utilised in pairs to power the post-war built Vosper 68ft Mk2 RTTLs. The type had previously been earmarked for use in the prototype British Power Boat Long Range Rescue Craft. This was to use four of these engines, however the craft was built but never used. 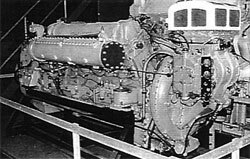 This famous engine was one of the first diesels to be built in bulk. This type of engine was used by numerous boat builders to power their craft. Three units were employed to power several Mks of the RAF 60ft pinnaces, whereas RAF 5Oft refuellers were each powered by two Perkins S6M diesels. Craft on display at BMPT that originally were powered by these engines include the RAF 4114ft & 40ft Seaplane Tenders as well as the 44½ft Army River class Fast Launches.